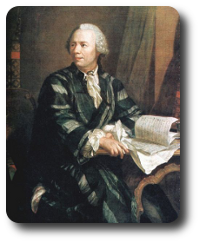 "What is Project Euler? Project Euler is a series of challenging mathematical/computer programming problems that will require more than just mathematical insights to solve. Although mathematics will help you arrive at elegant and efficient methods, the use of a computer and programming skills will be required to solve most problems. The motivation for starting Project Euler, and its continuation, is to provide a platform for the inquiring mind to delve into unfamiliar areas and learn new concepts in a fun and recreational context." I have written a walkthrough providing solutions in Python. For each problem I have written a series of hints for one particular approach to solving the problem. The final hint for each problem is my code for the solution. The Project Euler website states that each problem should be solved with code that runs in under a minute. ​Question - If we list all the natural numbers below 10 that are multiples of 3 or 5, we get 3, 5, 6 and 9. The sum of these multiples is 23. Question - The prime factors of 13195 are 5, 7, 13 and 29. What is the largest prime factor of the number 600851475143 ? Question - A palindromic number reads the same both ways. The largest palindrome made from the product of two 2-digit numbers is 9009=91×99.9009=91×99. There is no built in function to check if a number is a palindrome, so we need to write our own. If you convert an integer into a string then it gives much more flexibility in picking out specific digits. Question - 2520 is the smallest number that can be divided by each of the numbers from 1 to 10 without any remainder. Hence the difference between the sum of the squares of the first ten natural numbers and the square of the sum is 3025−385=2640.3025−385=2640. As we are looping through we should keep two running totals - one adding up the squares of the number we are currently on, one adding up the number we are currently on. Question - By listing the first six prime numbers: 2, 3, 5, 7, 11, and 13, we can see that the 6th prime is 13. In order to write an algorithm that runs in a reasonable length of time we will need to optimize our test of whether a number is prime or not. Question - The four adjacent digits in the 1000-digit number that have the greatest product are 9×9×8×9=5832.9×9×8×9=5832. There exists exactly one Pythagorean triplet for which a+b+c=1000. We can supply the integers a and b, then calculate c based on the fact that it is a Pythagorean Triplet. ​Question - The sum of the primes below 10 is 2 + 3 + 5 + 7 = 17. This one is quite straightforward, we just need to loop through the first 2 million integers, and check for each one if it is prime. We can even reuse our primality test from earlier problems. Question - In the 20×20 grid below, four numbers along a diagonal line have been marked in red. a = "08 02 22 97 38 15 00 40 00 75 04 05 07 78 52 12 50 77 91 08 49 49 99 40 17 81 18 57 60 87 17 40 98 43 69 48 04 56 62 00 81 49 31 73 55 79 14 29 93 71 40 67 53 88 30 03 49 13 36 65 52 70 95 23 04 60 11 42 69 24 68 56 01 32 56 71 37 02 36 91 22 31 16 71 51 67 63 89 41 92 36 54 22 40 40 28 66 33 13 80 24 47 32 60 99 03 45 02 44 75 33 53 78 36 84 20 35 17 12 50 32 98 81 28 64 23 67 10 26 38 40 67 59 54 70 66 18 38 64 70 67 26 20 68 02 62 12 20 95 63 94 39 63 08 40 91 66 49 94 21 24 55 58 05 66 73 99 26 97 17 78 78 96 83 14 88 34 89 63 72 21 36 23 09 75 00 76 44 20 45 35 14 00 61 33 97 34 31 33 95 78 17 53 28 22 75 31 67 15 94 03 80 04 62 16 14 09 53 56 92 16 39 05 42 96 35 31 47 55 58 88 24 00 17 54 24 36 29 85 57 86 56 00 48 35 71 89 07 05 44 44 37 44 60 21 58 51 54 17 58 19 80 81 68 05 94 47 69 28 73 92 13 86 52 17 77 04 89 55 40 04 52 08 83 97 35 99 16 07 97 57 32 16 26 26 79 33 27 98 66 88 36 68 87 57 62 20 72 03 46 33 67 46 55 12 32 63 93 53 69 04 42 16 73 38 25 39 11 24 94 72 18 08 46 29 32 40 62 76 36 20 69 36 41 72 30 23 88 34 62 99 69 82 67 59 85 74 04 36 16 20 73 35 29 78 31 90 01 74 31 49 71 48 86 81 16 23 57 05 54 01 70 54 71 83 51 54 69 16 92 33 48 61 43 52 01 89 19 67 48"
28: 1,2,4,7,14,28We can see that 28 is the first triangle number to have over five divisors. This one is another fairly straightforward problem, we just need to generate the triangular numbrs sequentially, and count the factors. Question - Work out the first ten digits of the sum of the following one-hundred 50-digit numbers. 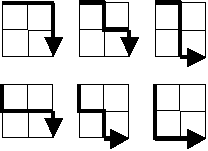 Question - Starting in the top left corner of a 2×2 grid, and only being able to move to the right and down, there are exactly 6 routes to the bottom right corner. ​How many such routes are there through a 20×20 grid? Question - 215=32768215=32768 and the sum of its digits is 3 + 2 + 7 + 6 + 8 = 26. What is the sum of the digits of the number 21000? Question - If the numbers 1 to 5 are written out in words: one, two, three, four, five, then there are 3 + 3 + 5 + 4 + 4 = 19 letters used in total.If all the numbers from 1 to 1000 (one thousand) inclusive were written out in words, how many letters would be used?